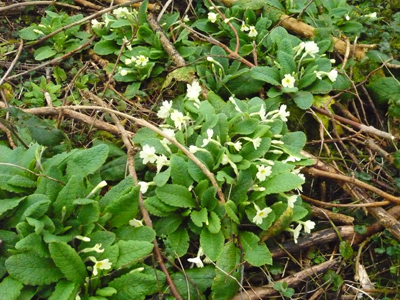 I have been given the key to a very special place, a little wood full of wild flowers. 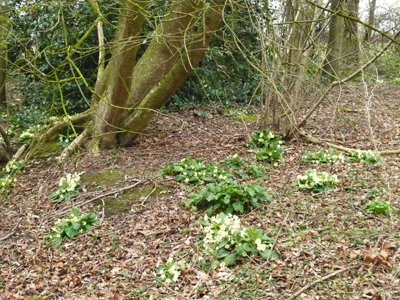 at the moment it is full of primroses, but a few wood anemones are out, and soon there will be a snowstorm of white flowers. 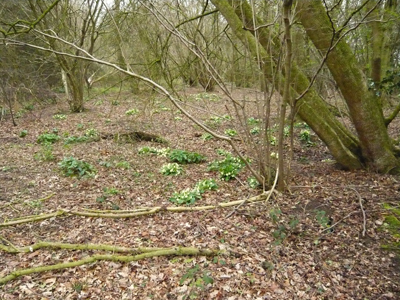 as about half of it is covered with the leaves of these rare woodland plants. this is a more open and drier place than the boggy roebuck wilderness, and it has a little loving attention paid to it, there are new trees planted and bee hives in one corner. 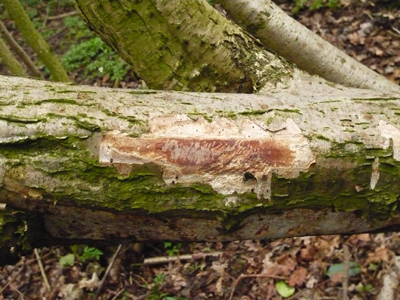 I spent an hour wandering around with my camera, and I found some fraying posts – the roe come here too. 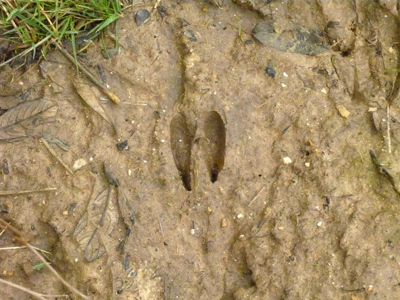 there were hoof-prints in the field on the way. here’s a place the buck has been scraping at. a lot of it is hazel, which make these groves of bush-like clones. 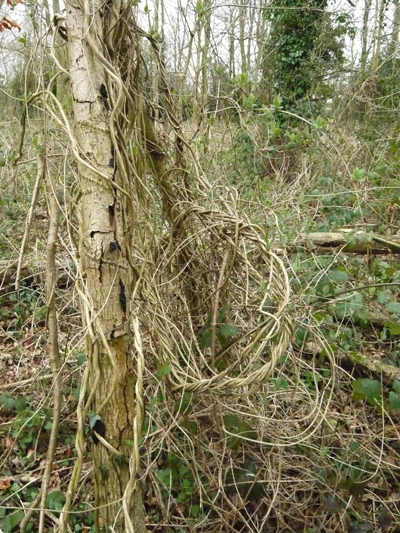 this is a wonderful tangle of honeysuckle, it looks man-made. 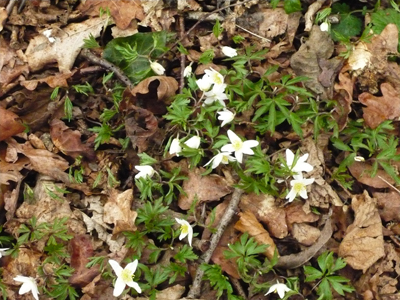 I will go back in a couple of weeks, I think the anemones will be more impressive then. today I saw a fox in the water meadow, looking for voles in the long grass, his deep russet coat glinting in the sunlight. 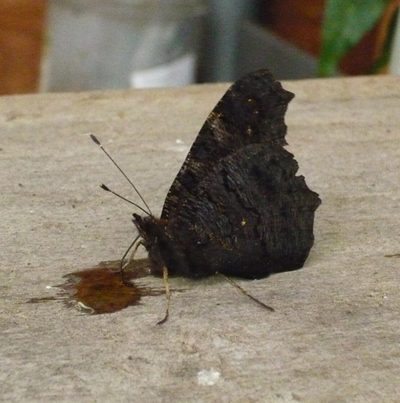 yesterday when I was in my workshop, I found this butterfly trapped in a spider’s web. 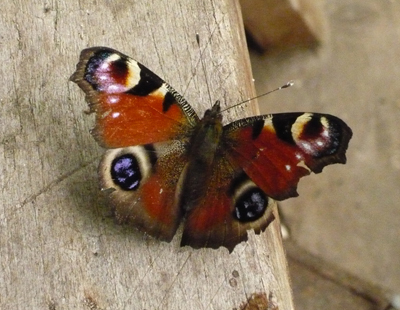 it’s a peacock, and they often hibernate in sheds. I detached it from the web silk, and as it seemed very slow, and the weather not really warm enough for butterflies, I fed it sugar water. it sucked away enthusiastically, unfurling the coiled tongue. when I next looked it had crawled to the edge of the bench and tucked itself away for further sleep, I imagine. more rescues! I heard that the kestrel had spent three days on the floor of the aviary before getting up enough strength to fly at all. they think another week and he will be well enough to release. I am beginning to get the feel of this magma crank, but soon I must resuscitate the two buckets of reclaim clay and then that will be a whole different thing. yesterday there were five hares on the skyline of the wheat field, boxing, leaping about, carrying on their spring rituals. three came towards us, oblivious, about halfway down the hill, and two proceeded to mate, with the supernumary male jumping on and off them, trying to push the lucky one off. Finally the female rushed off with the two males in pursuit, accompanied by the shrieking of the frustrated dogs, as I had a very tight hold on them. 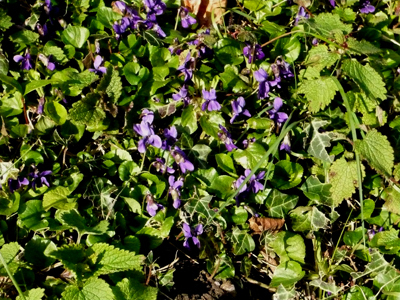 violets are everywhere, in the grass of banks and hedgerows, in my garden, on the edges of other gardens, in the woods and ditches. I got a glimpse of the roe buck today, just an instant’s vision of brown limbs between the tree trunks in the wood. 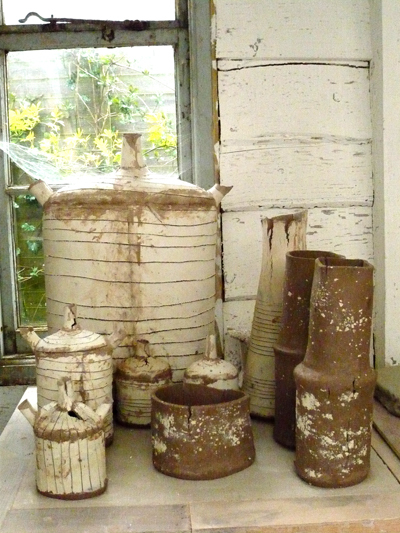 pots are coming on, here’s a row of happy little ones dried out on the heater in the workshop. 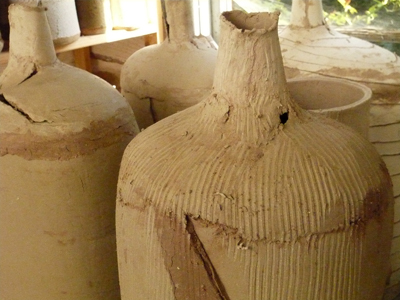 looks like I am going to have a firing of tall pots all laid on their sides again at 1150 C in order to shrink them for the glaze firing. I have four which are all about twenty three inches. 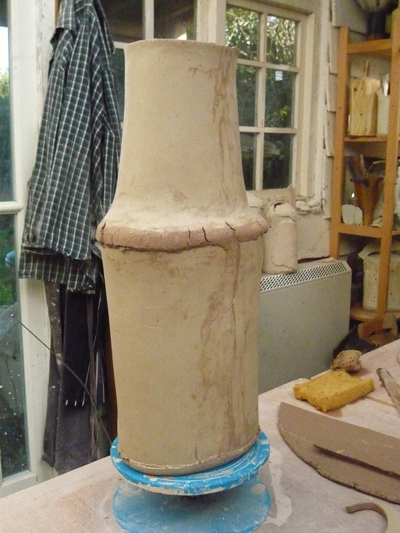 but here is today’s effort – polka dot pot. the white spots are porcelain inlay, and under a thin veiling of my barium glaze they should look like blossom, or snow flakes. note the partly open door behind … the weather has suddenly become mild and calm. vernal equinox came with beating winds, full moon and high tides. ditches are full. the morning’s snow added to the waterlog. earlier this week I found a casualty of the harsh weather – a young kestrel flew out of the hedge into the path of the dogs and lay there on his back, one wing raised, beak open and talons ready in defence, eyes glaring. thinking he had a broken wing, I picked him up with my down jacket (if the head is in the dark birds are usually quite passive) and got him into a cardboard box at home. the local Hawk and Owl Trust are only a couple of miles away, they found him all in one piece but starving, so took him off for feeding up in a big aviary. I am going to release him when he’s ready, so I hope to have some photos of that later. 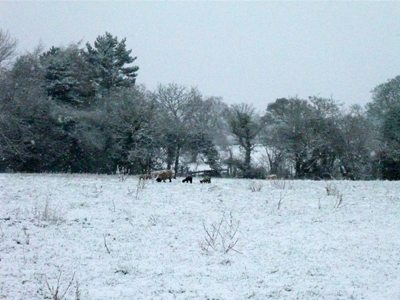 there are two old pony shelters in there and the first day there was much calling as babies were in the shelters away from the rough weather. 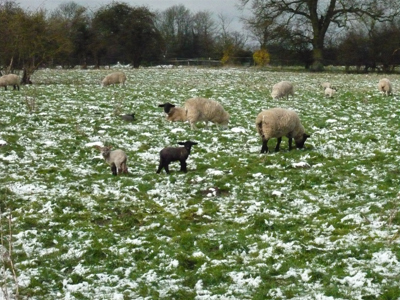 I am sure they were cold and wet this morning. 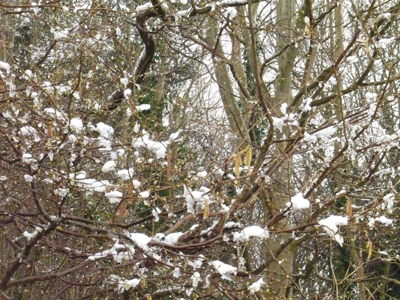 briefly everything looked very pretty, with about half an inch of fluffy snow icing on every branch, flower and budding leaf. by midday it was all liquifying and dripping everywhere. green took over from the white. 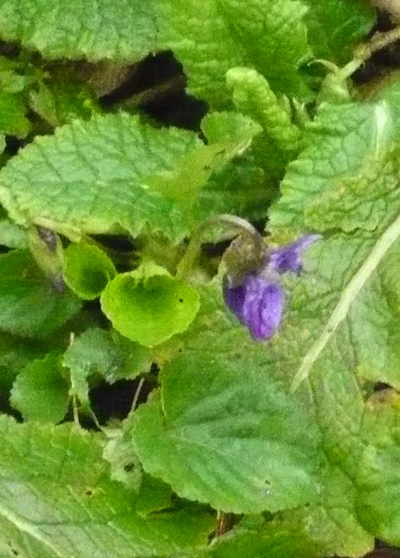 this week I noticed how many plants are showing green leaves suddenly, in my garden. 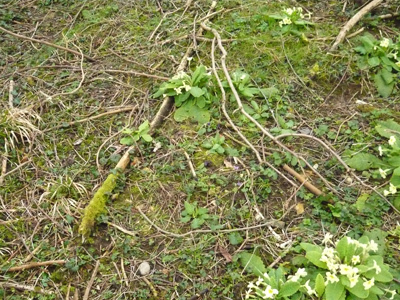 the montana, the dog roses, the wild clematis, honeysuckle and buddleia are all sprouting inch long or more new growth. (I have yet to prune the buddleia). more pots have been sprouting too. 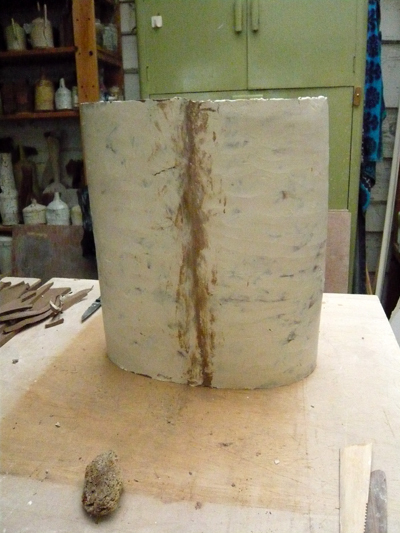 yesterday, the first an attempt to work the vase shape from the smaller ones as a more massive and monumental piece, and the second a tried and tested shape, both crank layered with the smoother S&T material which fires to a beautiful smooth ivory. 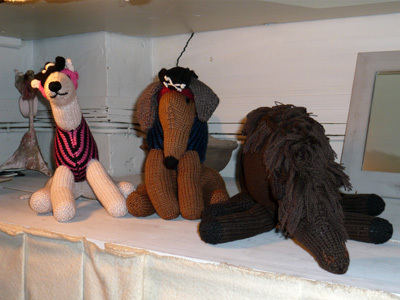 maybe the first one needs a bit more doing to it – like the combing on the tall blue-black topped piece (now sold). 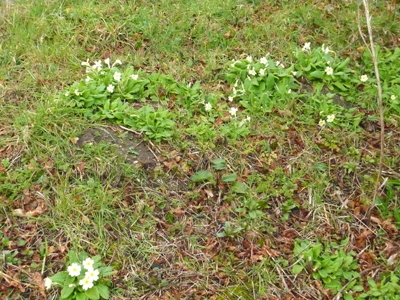 the primroses are really at their best now, and there are pretty pale carpets of them in the wood. 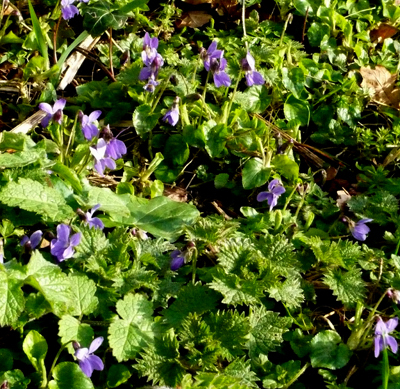 while the violets are dotted across the whole of the woodland floor, but although there are three in the centre of this photo, they are very hard to see. the wood is completely untouched by any sort of forestry. fallen branches are strewn everywhere, and it is very boggy. 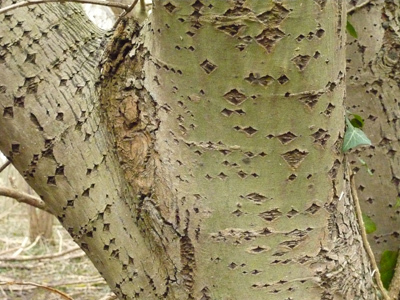 this trunk has some sort of disease which has patterned the bark; its very beautiful, but I don’t think it’s doing the tree any good. 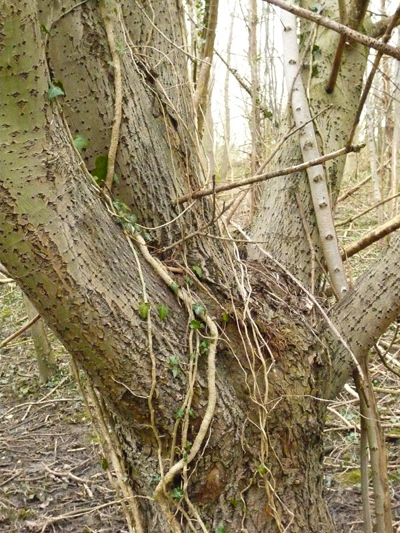 its an unusually big tree, most are not much more than a foot in circumference; a mixture of ash, sycamore, and a lot of hornbeam. Ivy and honeysuckle drape themselves over everything. 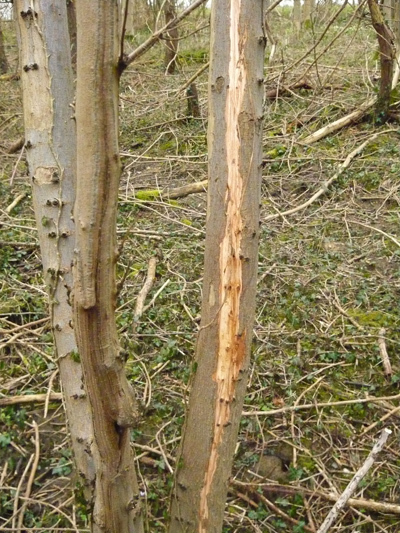 it is the domain of the roe buck, his sharp little hoof prints clearly imprinted in the mud around the edges of the wood, and the bark scraped off trees where he has been fraying the velvet off his new antlers. 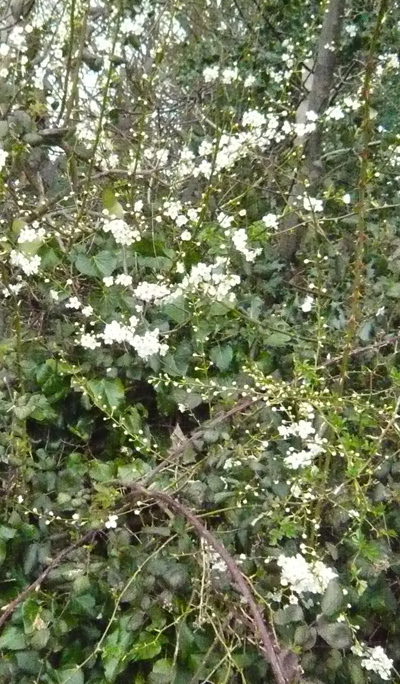 the blackthorn is out everywhere in the hedges, and in my garden. perhaps there will be a good crop of sloes this autumn. 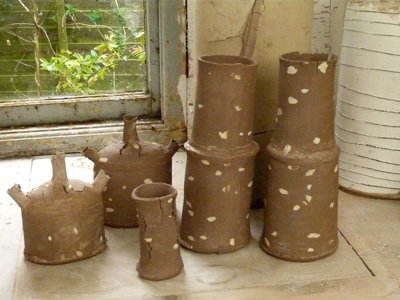 this afternoon I made five smaller pots. 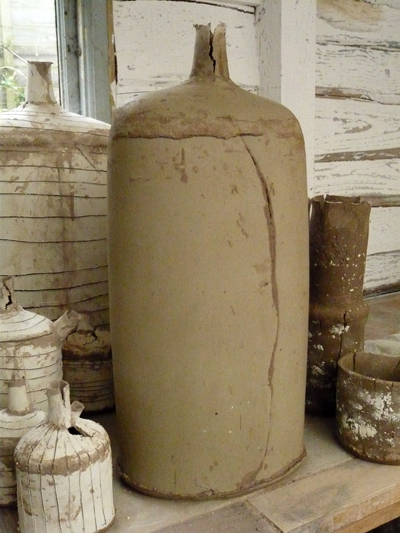 the north-easterly and now north-westerly winds of the last few days keep the clay drying quite well, even without lighting the wood burner. 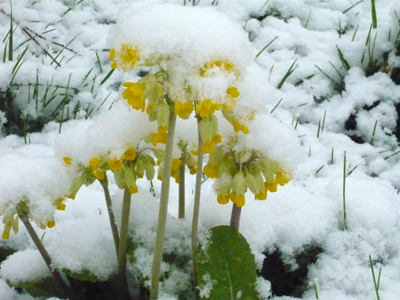 yesterday the sun came out and it felt like April. I did try sitting in the garden to read the paper, but it was actually a little chilly. 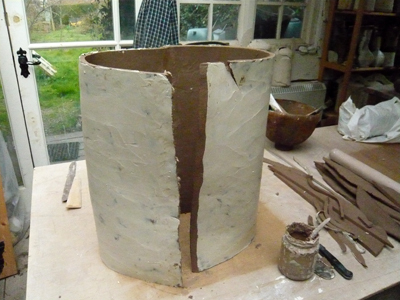 but my studio was warm, and the clay got drying, so I put together a new pot for a new start to making. this is the pot which was ordered at the Beaux Art’s exhibition opening; I was asked for a similar pot to the very big one which was the last piece I made in December. an ambitious piece to start again with, but I hope it will be a good way into expanding my practice. we went to Holt Lowes for a walk. 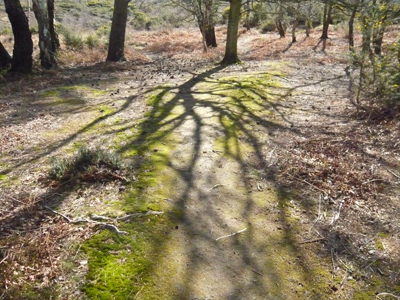 it was the sort of weather which brings the adders out of hibernation, even earlier than this, I discovered on checking. the time when they are most likely to be seen is April, as they are mating then and are much bolder. 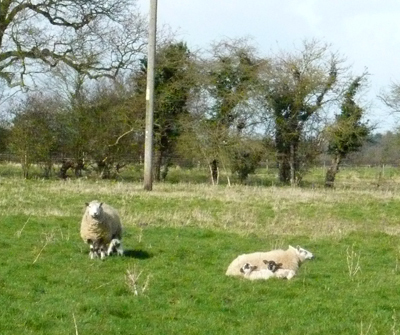 I have seen one coiled next to the path in April. the place is yellow with gorse in flower, but hardly anything else showing signs of life yet. 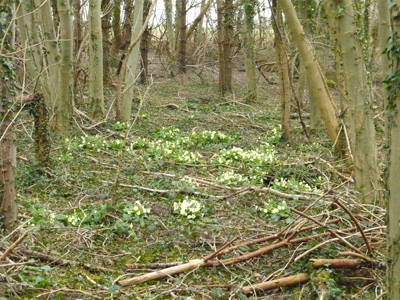 in fact it is at its most bare now, with the bracken all trampled down to nothing and no leaves. 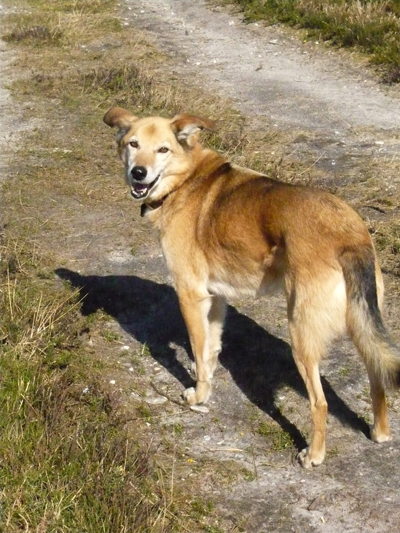 and here is old Sal in the sun. there was a huge sulphur-yellow butterfly flitting about. 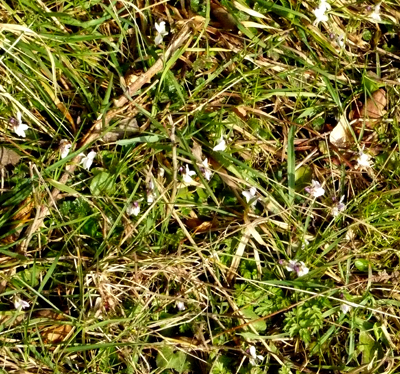 sadly I failed to photograph it, as I dithered it flew further and further away. it was a male Brimstone (the females are paler) and apparently it’s quite normal to see them so early, in fact they are about from mid-February onwards, until November. they hibernate in ivy, but they need buckthorn to survive. it looked quite bizarre against the dead bracken. but the barometer shows very low pressure, we are in for a big gale tomorrow. last week’s brought down a beautiful lone beech tree which stood in the hedge in Clip Street. its branches had grown like a head of hair in the wind, stretching away from the predominant westerlies. 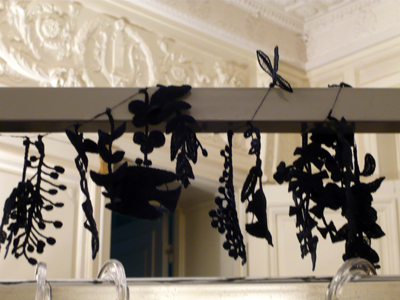 back in the maid’s room with my collection last week, after an eventful night (the earthquake) and journey (taxi got the time to pick us up for the train wrong). this was the first time I had gone to Paris via our local station and St Pancras. I am not sure that its the best way for me, as getting from Kings Cross to St Pancras is a bit of a trek with a lot of luggage, and the online ticket booking system doesn’t work properly with the two sets of tickets to print out. I think next time I may go via Ashford again. but St Pancras is certainly impressive, with a great selection of snack bars! not so much people watching this time as I had a companion. 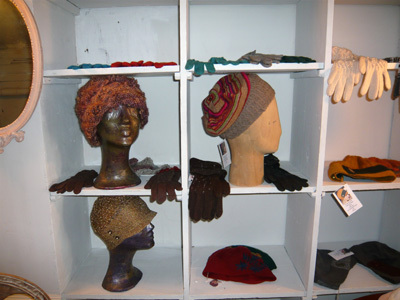 the “family” in Philippe Model’s house now somewhat smaller than in previous years, eight designers, or nine in fact, as Philippe now has a shoe collection, with Mina Perhonen leaving for a much bigger space around the corner. 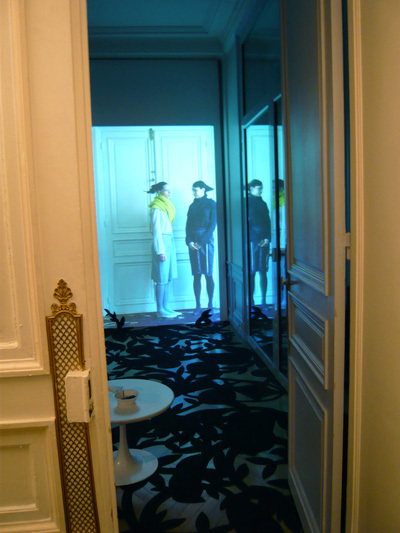 and this beautiful apartment was the background for a film of one model wearing Mina Perhonen Winter 2008-9, who came and went, met herself, looked a little unsure, became more confident, leant on the door, opened it, shut it, walked past it, until every outfit had been shown. projected lifesize on the wall with quiet piano music, it was a magical and atmospheric installation of a very elegant collection. its small and fairly scruffy, no lifts or room service, with the usual french bathroom occasional smells, but only 60 Euros a night for a big room, and clean towels and sheets every day. 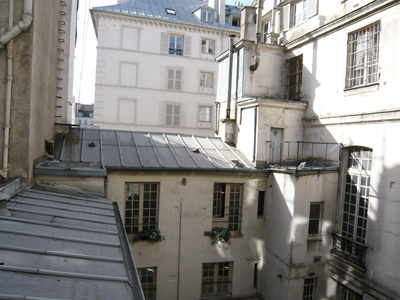 you do need to ask for a room at the back though, over looking the courtyard. and ear plugs are quite a good idea if you are not a sound sleeper, as the walls are thin.